Bring the MorningStar #BurgerBar Truck to Your Next Backyard Celebration! Recreate the MorningStar #BurgerBar Truck in your backyard! Summer is drawing to a close and school will be starting soon. While other parents may celebrate the return to school and a set schedule, I am sad. Sure, I am stuck at work most days. And, they have swimming and camp to fill their days, but I'm still not ready for the fall. We love the long summer evenings, lazy days by the pool, and easy schedules. Especially the nights we have dinner outside. On a recent trip to Walmart, we were treated to lunch from the MorningStar Farms® Burger Bar Truck. 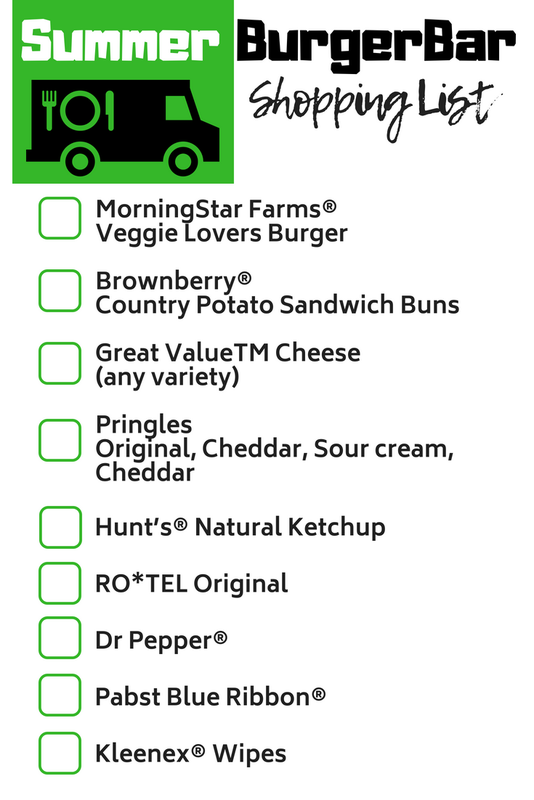 Check out BurgerBarTruck.com to see if the MorningStar Farms® Burger Bar Truck is traveling to a Walmart near you. Plus, you can find even more delicious recipe inspiration from renowned Chef Capon, 6-time Burger Bash NYC Champion! I picked the new Morningstar Farms Quarter Pound Veggie Burger. It is delicious! It's a perfectly seasoned, quarter-pound burger that will fill your bun with MORE and leave you satisfied every time. Each bite is packed with plant-based protein and tasty veggies. 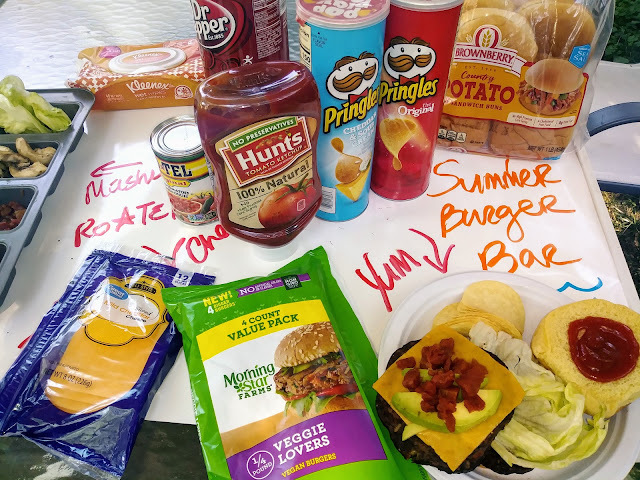 As I munched on my veggie lover's burger, I decided to bring the food truck feel home and throw a summer burger bar in our backyard. A celebration of the things we love about being together while looking forward to the start of school. 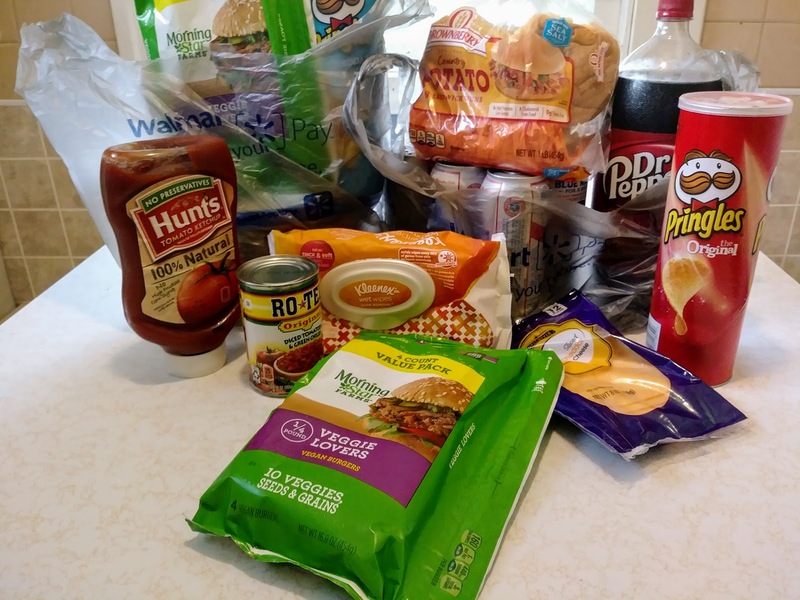 Shopping at Walmart is so convenient, it was my one stop shop for getting all my burger bar essentials! And, I used the food truck's order form to help shop for what we would need to have our own burger bar at home. I created a list for you to print out so you can easily create a burger bar at home, too! Wanting to keep our burger bar easy and simple - I used a mini loaf pan (muffin pan would work, too!) for the toppings and to make it easy to carry outside. Cheese does not last long in our house and out in the open even less time. For the refreshments, options are key to providing the best burger bar experience. I picked up some Dr Pepper and Pabst Blue Ribbon®, because nothing quite hits the spot like a refreshing ice cold beverage on a hot summer day. Fresh tomatoes are great on any burger, but RO*TEL Original with the combination of vine-ripened tomatoes blended with zesty green chilies and savory spices add the bold zest of the Southwest and will take it to a whole new level of goodness! Throw some Hunt's® Natural Ketchup, fresh avocado and lettuce on there and your taste buds will thank you. I'm trying not to be too sad for the kids' sake, but we only get so many summers with them! I don't want to waste the time prepping. That's why I love that MorningStar Farms products are an "as-is" meal solution! Visit BurgerBarTruck.com for additional savings at Walmart!